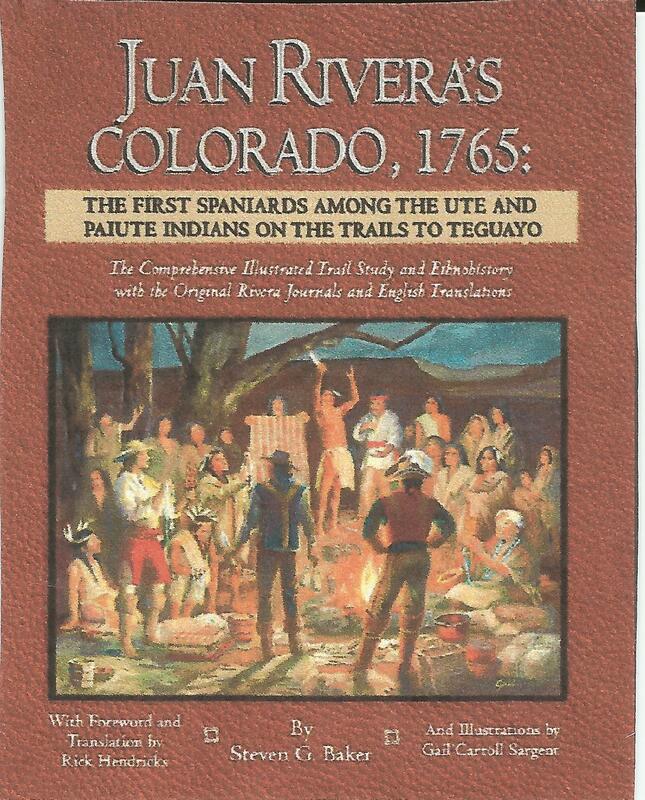 Juan Rivera’s Colorado, 1765:…. Should be read by anyone interested in early Spanish exploration and the history of Colorado and its native peoples. This ground-breaking volume includes Rick Hendricks’s thoughtful English translations of Rivera’s Spanish narratives of his two trips into western Colorado. Through meticulous scholarship and the help of copious original color illustrations by Gail Carroll Sargent, Steven Baker becomes the first scholar to successfully trace the routes and explicate the context of Rivera’s travels and day-to-day narratives. Rivera provides the first meaningful descriptions of the Centennial State and its Ute and Paiute Natives. Written for both scholarly and popular audiences, Baker’s discussion of Rivera’s travels weaves a rich, readable, well-documented, and never-before-presented tapestry of one of the American West’s least understood Spanish expeditions. Rivera was sent northward from New Mexico to explore for silver and to locate and explore the mighty Colorado River. He was also charged with investigating accounts of strange heavily bearded men who looked like Europeans and were said to live along the river in the legendary province of Teguayo. Although he only got as far as the Gunnison River near Delta, Colorado, Rivera set the stage for the better-known 1776 journey of Fathers Domínguez and Vélez de Escalante. Baker demonstrates how the trip of these regional historical icons was in very large measure intended to complete Rivera’s failed mission to find the bearded men, which they succeeded in doing. In addition to proving the strong connections between Rivera’s and the Franciscans’ expeditions, Baker solves a major historical puzzle that has defied accurate explanation for nearly half a century. He demonstrates that Rivera traveled only in New Mexico and Colorado and did not reach Utah as is almost universally believed by historians today. In accomplishing this, Baker corrects a massive mistake in the historical writing of the American West and returns Rivera to his rightful place as a corner stone in the foundation of Colorado's historical patrimony. This book is in full color with special color drawings and maps. It is hardbound with a dustjacket and is 404 pages long.